Great films are transportive – they cultivate a sense of time and place that feels lived-in and specific, and use elements of production design, costume and sound to tell a story separate from the plot. In Only Yesterday, the place is Tokyo, and the time is 1966. Taeko (Miki Imai) is eleven-years-old, and curious about the world unfolding around her. Besides her academic life, Taeko is forced to work through the onset and upheavals of puberty, a first crush, and arguments with her family as she yearns – against the will of a stern patriarch – to go on holiday like her friends. Her experiences, drawn in slow and lyrical scenes, feel lived-in and specific because they are the product of memory, and, like many other great films, Only Yesterday is also about the act of remembrance. The film is directed by Isao Takahata, whose patient and painterly style has defined two of Studio Ghibli’s finest works – Grave of the Fireflies (1988) and The Tale of the Princess Kaguya (2013). He starts Taeko’s story in 1982, when the unmarried 27-year-old is boarding a sleeper train from Tokyo to Yamagata. As the engine rushes into motion, fragments of Taeko’s childhood begin to reform and reverberate through her memory, and the bold, colourful world of her present suddenly disappears, ushering in the hazy, watercolour landscape of youth. This aesthetic delineation is subtle but hugely effective. As in all of his films, Takahata’s style is an organic extension of the narrative’s themes and feeling, so his artistry – the way time is marked by how much colour is used in the scene – becomes literally transportive, reflecting the emotional arc of his protagonist (and, in turn, her memories are trigged by travel – a physical transportation through time and space). Even the film’s title is a nod to its structural technique – Only Yesterday is surely a compression of the phrase “it feels like only yesterday,” used to recall the emotional proximity of distant events. Takahata avoids conventional methods like match cuts or dissolves, and instead uses hard cuts and aesthetic shifts to suggest that Taeko’s memories are collapsing into her reality. But this description belies the film’s gentleness, and its wise decision to focus on small life changes rather than a singular, explain-it-all moment that could illuminate Taeko’s present-day ennui. Takahata uses his palette to evoke the flavours, textures, and places that have shaped Taeko as a woman, and pays particular attention to subtle family dynamics and gestures. In one great scene, the family gather around a pineapple and marvel (in post-war Japan, imported fruits were incredibly rare and expensive). After several days, Taeko’s mother learns how to prepare the pineapple properly, and the family sit down together to enjoy their treat. Unfortunately, nobody likes the fruit, but Taeko, eager to create a special and defining moment with her family, pretends to love it and starts scoffing down leftover portions, forcing the moment to become significant. It’s a beautifully observed scene, played in total silence, which speaks volumes to the way Taeko views her family life and yearns for new, foreign experience. In 1982, she is finally forging a path of her own, and creating genuine moments with a new family. But the lost adolescent who haunts Taeko’s journey casts doubt over these experiences – does her life belong here, or in the Tokyo of her family? In the tradition of Ozu and Naruse, Takahata draws complex observations on class, gender, and urban vs rural life from this plot, and even if he finally lands on a too-neat resolution, he at least does so in a spellbinding fashion, with one of the most beautiful credits sequences ever made. This new Blu-Ray transfer is crisp and detailed, and surely the best the film has looked since its initial, limited release (the film grossed ¥1.87 billion domestically, but wasn’t released in the U.S. until January of this year). 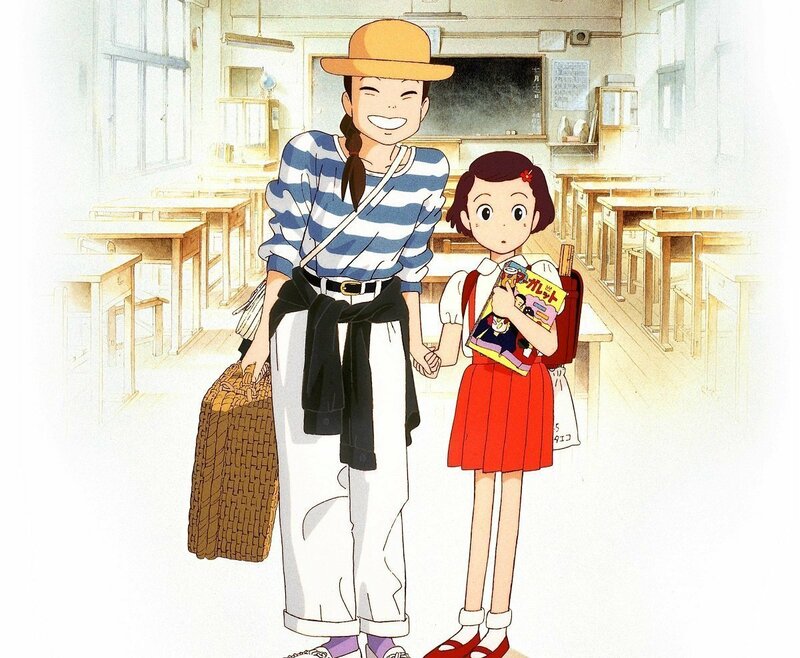 Miki Imai gives a wonderful performance in Only Yesterday, and while the English dub is capably performed by Daisy Ridley (The Force Awakens) and Dev Patel (Chappie), their work lacks the nuance of the original voice recording, and the themes and aesthetic of the movie are so Japanese that their voices become a distraction (I’ve had this issue with many Ghibli releases). Other extras include interviews and an insight into the recording sessions for the vocal track. A solid presentation of an often overlooked film.